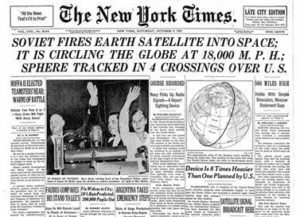 4 October 1957 was a major milestone in aerospace history, marking the first launch of an artificial satellite into Earth orbit. 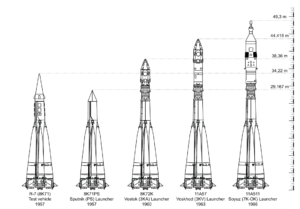 Since 1955, a relatively low-key “space race” between the U.S. and the Soviet Union had been underway, with the U.S. openly developing the small Vanguard booster rocket and satellite and planning to launch the first satellite into orbit during the International Geophysical Year (1 July 1957 to 31 December 1958). Secrecy surrounding the Soviet Union’s space program made the successful launch of Sputnik 1 a significant political coup. 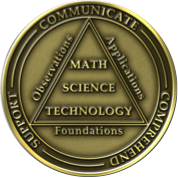 This event served to greatly energized the lagging U.S. space program and prompted calls for more technical education in the U.S. 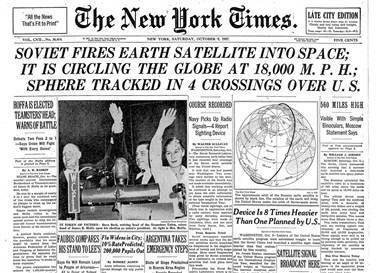 The satellite transmitted a continuous “beep-beep-beep…” on two frequencies until 28 October 1957, when it went silent. 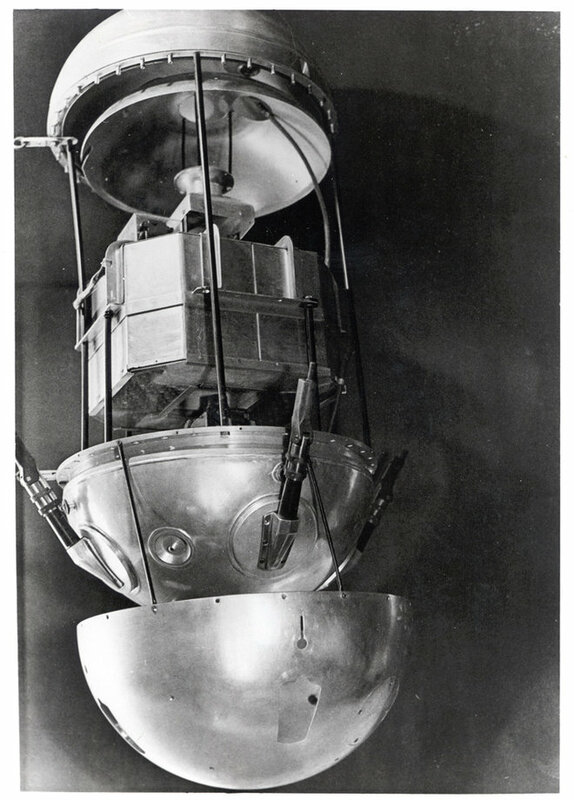 Sputnik 1’s low Earth orbit decayed over the next three months and the satellite reentered the Earth’s atmosphere and was destroyed on 4 January 1958, after about 1,400 orbits. 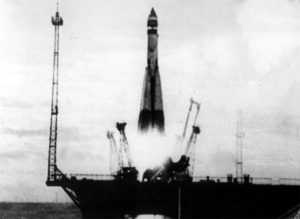 Sputnik 1 was launched by an R-7 liquid-fueled booster rocket, which was a version of the Soviet Union’s first intercontinental ballistic missile (ICBM), the SS-6. The R-7 booster rocket, which consisted of a liquid-fueled core stage surrounded by four liquid-fueled strap-on boosters, was developed by the design bureau headed by Sergei Pavlovitch Korolev (1906-1966). The strap-on boosters separated about 116 seconds after launch. The core stage achieved orbit along with the Sputnik 1 satellite and the payload fairing. The core stage reentered the atmosphere in December 1957. The R-7 booster evolved into the launch vehicle for future Soviet Vostok, Voskhod and Soyuz missions, and a version continues in use today as the Russian launch vehicle taking astronauts and supplies to the International Space Station (ISS) aboard updated Soyuz spacecraft. The R-7 booster launched the larger Sputnik 2 satellite into earth orbit on 3 November 1957, before any satellite launch attempt by the U.S. Sputnik 2 carried the first living thing into orbit, the “space dog” named Laika. The even larger Sputnik 3 was launched on 15 May 1958. 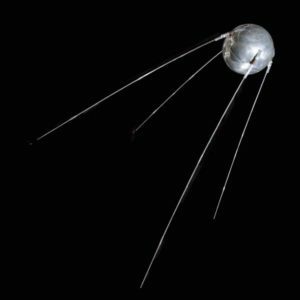 These first three Sputnik launches had lasting effects on the civilian space race and the military missile race between the U.S. and the Soviet Union. 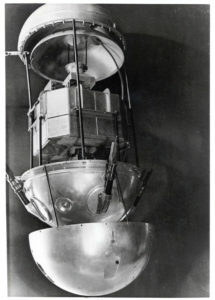 The U.S. civilian Earth Satellite Program (aka Project Vanguard) favored by President Dwight Eisenhower, planned to launch the first U.S. earth-orbiting satellite during the International Geophysical Year (IGY, 1 July 1957 – 31 December 1958) using a Vanguard rocket being developed by Naval Research Laboratory (NRL). 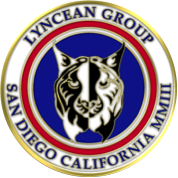 Vanguard was quickly eclipsed by the Army Ballistic Missile Agency’s satellite program, which was hastily mobilized after the Sputnik 1 launch. The Army – Jet Propulsion Laboratory (JPL) team, led by Dr. Werner von Braun (Army) and Dr. William Pickering (JPL), was successful on their first attempt and placed the first U.S. satellite, Explorer I, in orbit on 31 January 1958. After two launch failures, the first Vanguard satellite reached orbit on 17 March 1958. Thereafter, the Soviet – U.S. space race was a focus of national and international attention, with President John F. Kennedy setting a seemingly optimistic national goal in 1961: “…before this decade is out, of landing a man on the Moon and returning him safely to the Earth….” The U.S. Apollo 11 mission met this goal when the astronauts Neil Armstrong and Edwin “Buzz” Aldrin, Jr. landed on the Moon on 20 July 1969, just 12 years after Sputnik 1 first reached earth orbit. This post was updated with additional content.